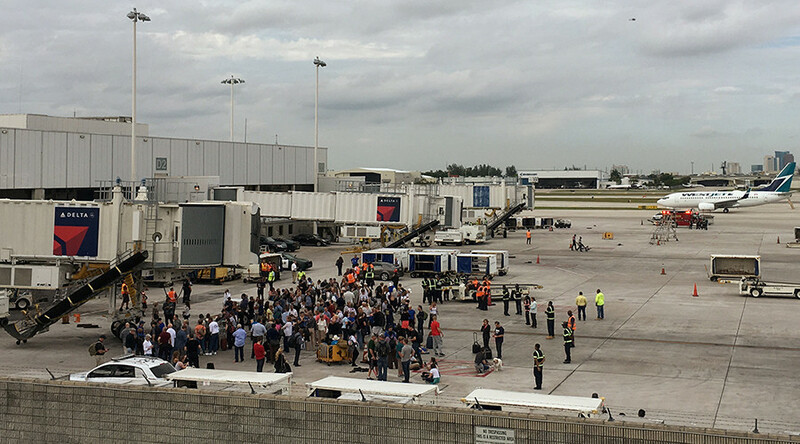 Thousands of terrified passengers were left stranded at the Fort Lauderdale-Hollywood International Airport in Florida, following the shooting that left 5 people dead five and 8 injured. As of 7:00pm Eastern, about six hours following the shooting, flights remained grounded. But travelers were allowed to return to their vehicles after parking garages had been cleared of any potential threats. Other travelers are not as lucky. A passenger stuck on Southwest Airlines flight 494 has warned he will go into diabetic ketoacidosis if he does not eat soon, Jason Rabinowitz with Airline Flyer reported. It may be hours before passengers are deplaned. WSVN reports that officials caution that the airport may be closed for the next 24 hours. In the initial chaos, people ran out on the tarmac from Terminal 2, and into other areas of the airport. Thousands ended up stranded as the police searched for the shooter. There were also reports of a second gunman at Terminal 1, but that turned out to be a false alarm. “People started yelling and screaming and frankly running toward any door - exit to get out of there” Mark Lea, who was in baggage claim where the shooting took place, told WLS. “People yelling, people screaming, everyone in a big pack just running as far as possible away from the shots. Our bus driver wasn’t sure what was going on, he was asking, ‘What’s happening? What’s going on?’ But no one was answering because everyone was in a rush to get safe,” a traveler told WFOR Miami. “We ran from the terminal out to the tarmac,” Dr. Massa told the New York Times. He added that officials marched people in a single file line, with their hands up and patting them down. Many people have been tweeting that they are stills stuck at the airport, or that they have family members who are stranded. What a day. Buried my oldest brother this morning in Fort Lauderdale. Niece stranded on tarmac at airport due to shooting. Scary, sad day. All seems calm now but the police aren't letting anyone out of the airport - at least not the area where I am. Latest reports say police are still on the scene, sweeping the area and using helicopters to search for other possible gunmen. those people are still stranded in the airport in Ft. Lauderdale as it sounds like building is being sweeped.